Beethoven: 9 Symphonien is ranked 2nd best out of 42 albums by Herbert von Karajan / Berlin Philharmonic Orchestra on BestEverAlbums.com. 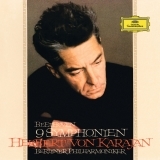 The best album by Herbert von Karajan / Berlin Philharmonic Orchestra is Beethoven: IX. Symphonie which is ranked number 6172 in the list of all-time albums with a total rank score of 261. Members who like this album also like: The Black Saint And The Sinner Lady by Charles Mingus, Pet Sounds by The Beach Boys and Sgt. Pepper's Lonely Hearts Club Band by The Beatles. Related links: top tracks by Herbert von Karajan / Berlin Philharmonic Orchestratop tracks of the 1960s, top tracks of 1963. Great Symphonies and Karajan is a good conductor, but Beethoven is also overrated. There is simply better classical music out there than Beethoven 9. Start Looking!